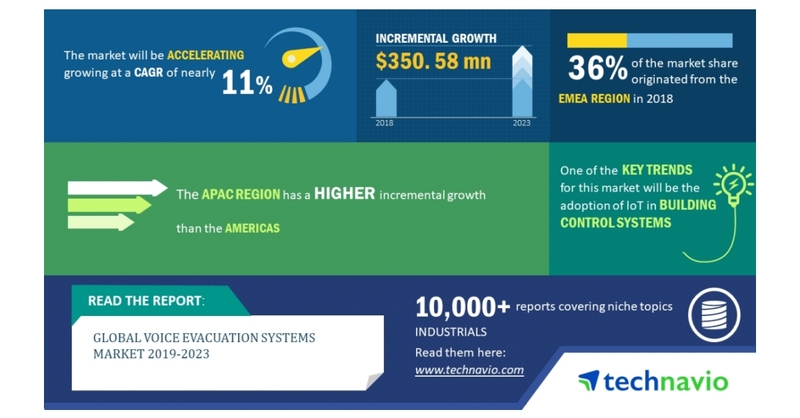 LONDON–(BUSINESS WIRE)–The global voice evacuation systems market research report by Technavio predicts the market to post a CAGR of around 11% during the period 2019-2023. A key driver for the global voice evacuation systems market is the growth of the real estate and construction industries. There is an increase in hospitality, tourism, and residential construction projects due to the growth of the real estate industry, which has resulted in a demand for emergency alarm and evacuation systems, including voice evacuation systems. The rapid urbanization and substantial investments in infrastructure have been aiding the global construction industry to grow. As per Technavio, the adoption of IoT in building control systems will have a positive impact on the market and contribute to its growth significantly over the forecast period. This global voice evacuation systems market 2019-2023 research report also analyzes other important trends and market drivers that will affect market growth over 2019-2023. The development of IoT has resulted in continuous growth in integrating IoT with building systems as well as safety equipment. IoT enhances data and control management without the need for human intervention. Traditionally, the voice alarm systems have been handled independently without any embedded support. But, changes in technology and integration of these technologies with existing systems have enhanced the reliability and eliminated redundancy and ensured quick response and notification. “The development of mesh networks, which can connect every device as a node to a central location is anticipated to support the connectivity of all devices and support data collection. The organizations, which develop codes and standards will also play an essential role in developing codes such as NFPA 72 that are in line with the technological advances,” says a senior research analyst at Technavio. This voice evacuation systems market analysis report segments the market by end-user (commercial sector, industrial sector, and residential sector) and geography (the Americas, APAC, and EMEA). The commercial sector held the largest voice evacuation systems market share in 2018, accounting for nearly 42% of the market. This end-user segment is expected to dominate the global market throughout the forecast period. The EMEA region led the market in 2018 with approximately 36% of the market share, followed by the Americas and APAC respectively. The EMEA region is expected to dominate the market throughout the period 2019-2023.